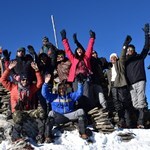 Finally Kedarkantha summit opened again on 18th March’19, as the first team after a long break reached the summit of Kedarkantha. Entire February and till mid of March snow was just too much to deal with and no team was able to reach summit. 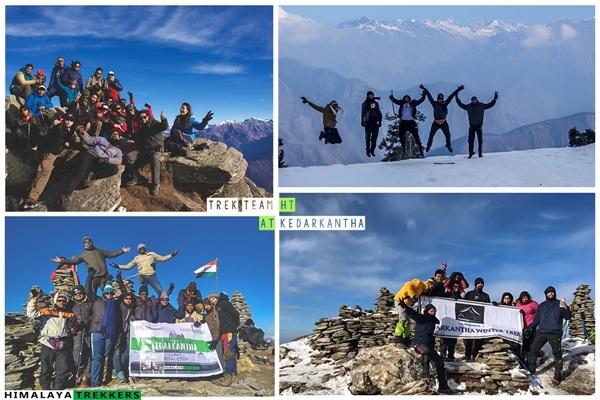 These are the pictures of our team who summit Kedarkantha on 24th March’19. This year snow will remain on summit till May beginning for sure. 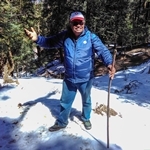 As of beginning of March, 2019, Kedarkantha peak may have accumulated “4 foot snow barrier“. February is always been the harshest month on mountains, cold and snowy. This winter promised good snow by mid December. Till mid Jan 2019 we got expected snow of 1 to 2 Ft varying from Juda Tal to the Kedarkantha peak. Then came the snow storm which poured more than 2 Ft snow at Sankri in itself. Summit to Kedarkantha peak was a mini expedition (just joking) mostly in February. 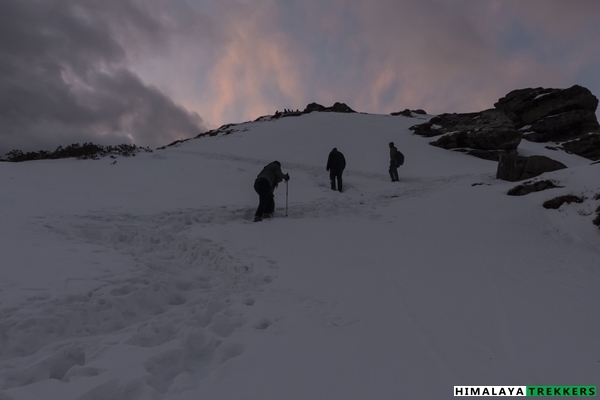 Groups trekked to Juda Tal, camped there , hiked around and returned frequently. Occasional small sized groups reached the summit. As the spring approaches, our spring trek groups are starting from 10th March, 2019. 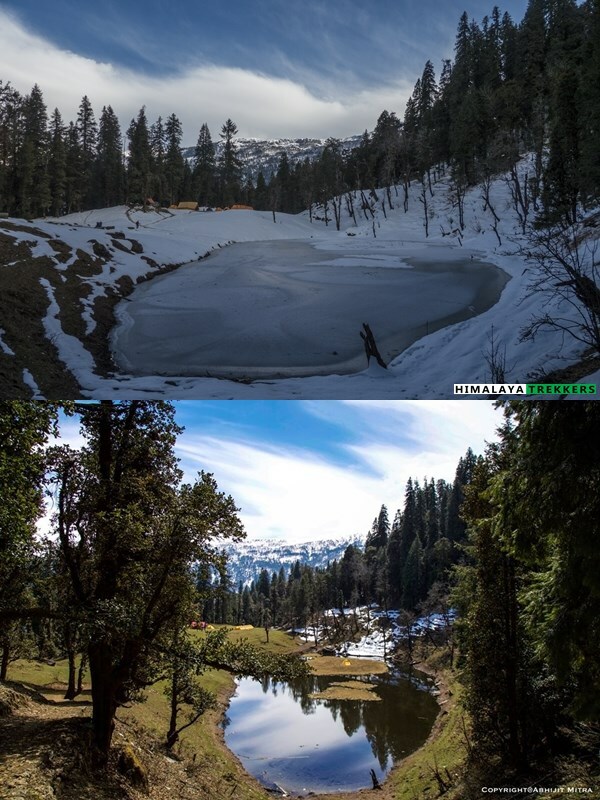 It is needless to say that Kedarkantha trail will remain covered with moderate to heavy snow in March and could very possibly till end of April 2019. 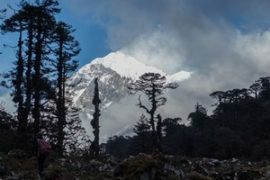 Till mid of March it will be challenging to reach the summit, but will ease out if there is no further significant snowfall. 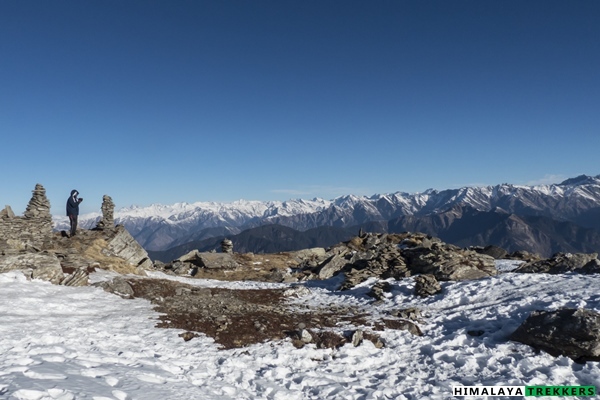 If you have searched for a winter or snow trekking trail in India and landed on our Kedarkantha trek details page, you reached the right place 🙂 Kedarkantha peak (Latitude 31.02257° N & Longitude 78.17185° E) at ~3810 m/12500 ft is situated in the fringe of Govind National Park, Uttarakhand. 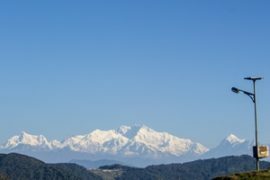 The region marks the boundary with its neighbouring state Himachal Pradesh and situated in western flank of Uttarkashi district. 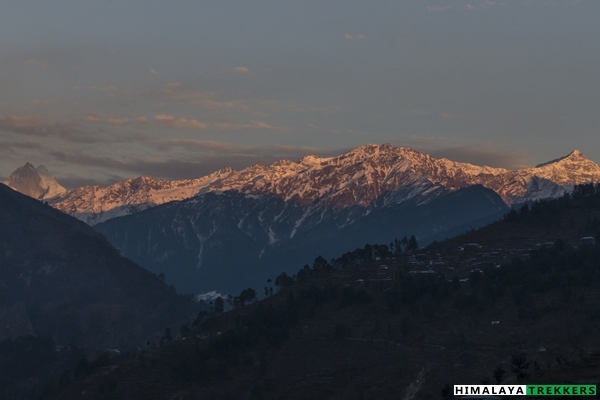 Naturally the area is surrounded by Shivalik hills and approaching to high Himalayan snow peaks. 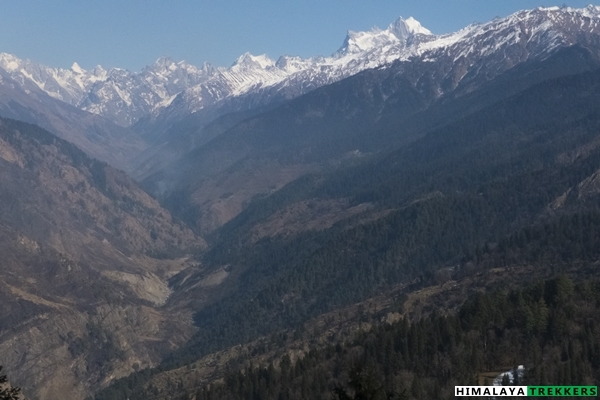 Winter and Spring add snow and blooming of flowers, a nearly ideal experience for your Himalayan hiking destination. 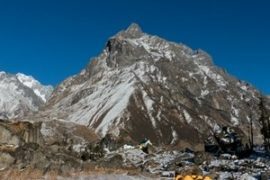 Surrounding Tons river valley, dotted with remote villages, snow capped mountain ranges in the horizon, and rich flora and fauna of the national park makes the short and easy hike to the Kedarkantha peak a enjoyable hiking experience. From summit you can see a 360° panorama, very special during sunrise. Peaks like Swargarohini, Bandarpunch, Black Peak create the backdrop. In winter or spring, the trail remains covered with fresh snow. 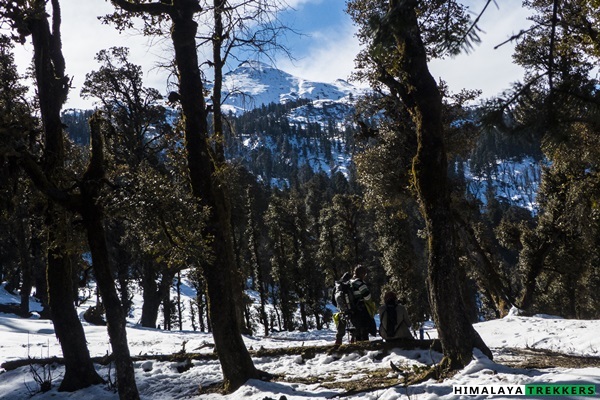 Snow patches amidst giant pine forest and snow covered meadow in this altitude, even late till spring, makes this trek a special one. Campsites in winter are mostly on or around snow. In spring during March and April another added bonus is the blooming of Rhododendrons. 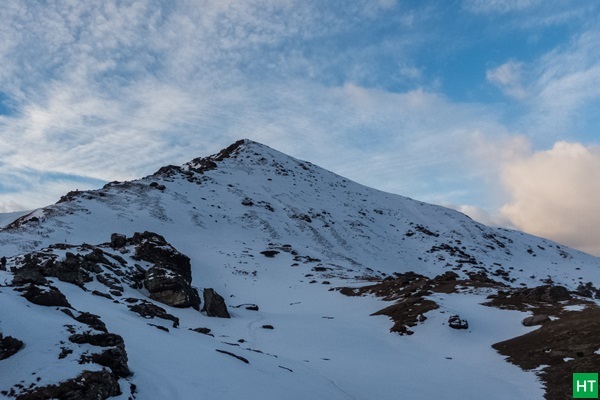 Temperatures are warmer than the harsh winter days but residual snow remains intact on higher altitude, specially on top and even till base camp. Here you will get a pictorial idea, before going to some facts and details. Your trek is guaranteed once we accept your booking. Furthermore the tour is insured for a maximum duration of 7 days, including Dehradun to Dehradun against any accidents or natural calamities. Transportation to reach and return from Sankri are not included. It is around ₹ 750 – 1000 one way. You may take a bus from Dehradun to Sankri, fare is around ₹ 400 one way. For more detailed inclusions & exclusions, check the COST INCLUSIONS tab. 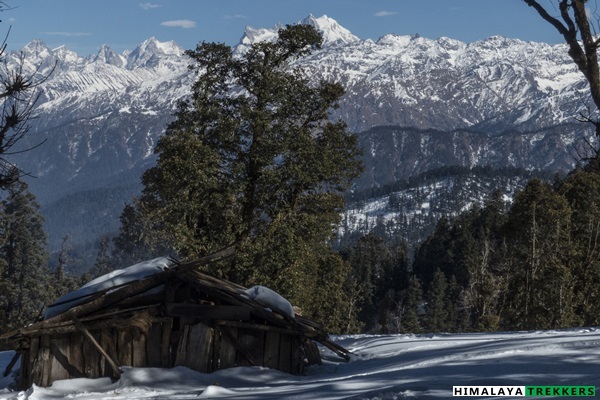 Being in Uttarkashi district and due to proximity with the Himachal border, Kedarkantha trail normally receives moderate to heavy snowfall in from December to February. Quite naturally winter snow deposition remains as late till April. Also a fresh snowfall in not rare even in spring on altitude around ~ 3000 m/10000 ft or above. 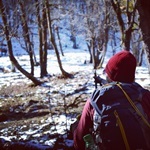 In general you will get patches of snow in and around Juda Tal campsite. As you climb higher, you will encounter more snow. From Kedarkantha base to the summit, normally the trail will be covered with moderate snow (around 6 inches). 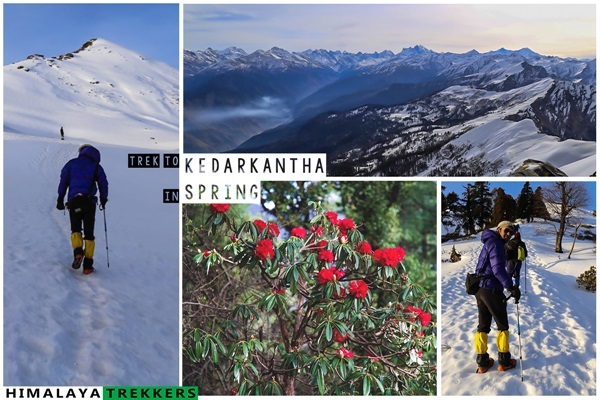 Another advantage of Kedarkantha spring trek is that the temperature will be warmer comparing to winter months and more conducive to trekkers who don’t feel like getting into subzero temperature throughout. Plus blooming of Rhododendron in the stretch between Sankri to Juda Ka Talao is definitely a bonus in spring :-). In winter Juda Ta Talab starts freezing around mid December and by month end the area receives moderate amount of snow (around 6 inch up to a feet). Surrounding conifer jungle set up creates the perfect back drop and a sudden snowfall can turn this site powdery and surreal :-). Snow remains as late as mid of March in this campsite. It is important to carry proper clothing in winter as the campsite temperatures are sub zero in winter. Winter: From December to February during winter the daytime temp remains cool and nights are cold. 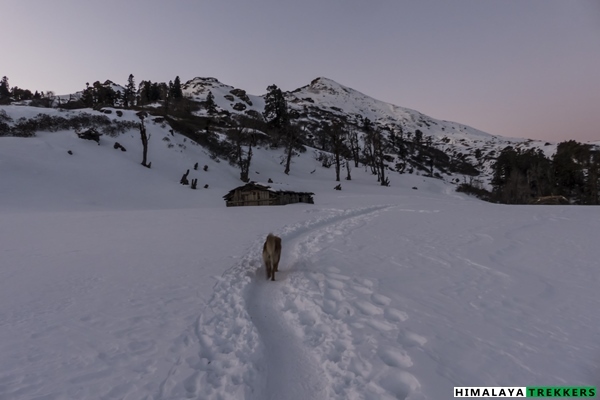 Night/early morning temperatures at Sankri, Juda Tal and Kedarkantha base can be around 2°C, -2°C and -5°C to -10° C.
a) A thermal base layer (warm woolly-cot material). b) A heavy jacket (Double layer or Fleece jacket ) as middle layer. You will not require the thermal base layer from May to October. Based upon your request we will arrange a pick up and drop from Dehradun to Sankri and back. This will be shared equally by the team members on actual basis. You pay directly to the driver/transporter. The fare is ₹ 5500 for a Tata Sumo/Mahindra Maxx one way. This can accommodate 5 to 8 people. A Tempo Traveller charges ₹ 9000 (12-13 seat) one way. This is NOT included in TREK FEE. 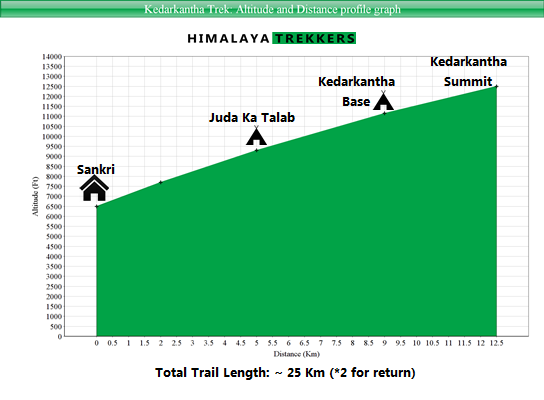 To reach the trek base Sankri independently/public transportation check the details in GETTING THERE TAB. 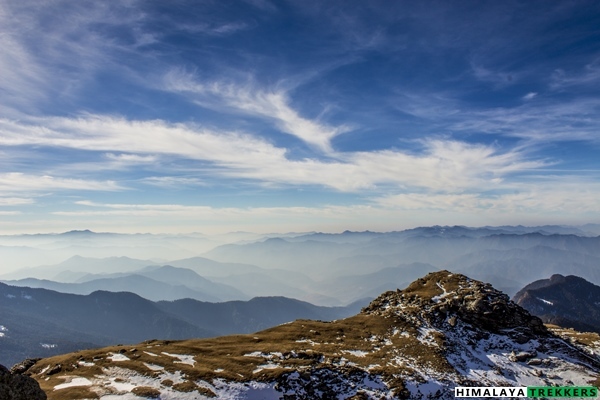 Duration: 4 days of trekking; Walking from Sankri to Kedarkantha summit and back to Sankri. 6 days from Dehradun to Dehradun. Prerequisite: No prior trekking experience is required. Good physical fitness is always desired in any trek. Further Option: Har Ki Dun trek can be combined. Access: Trek starting point (trek base) is Sankri, 200 Km from Dehradun. You can check the scheduled Fixed Departure dates in the calendar available inside Booking Form or inside REGISTER NOW form. Tour starting Dates are highlighted as per our itinerary (Day 1 of 6 days itinerary). 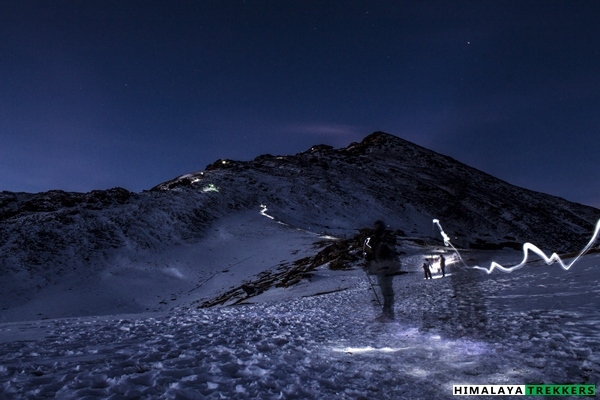 Trekkers need to reach Dehradun on Day 1 morning (latest by 8 am) or the previous night. Return to Dehradun on Day 6 evening (around 7 pm). Arrange your tickets for inward journey and return accordingly. Based upon your request we will arrange a pick up and drop from Dehradun to Sankri and back. This will be shared equally by the team members on actual basis. You pay directly to the driver/transporter. The fare is Rs 5500 for a Tata Sumo/Mahindra Maxx one way. This can accommodate 6 to 8 people. A Tempo Traveller charges Rs 9000 (12-14 seat) one way. This is NOT included in TREK FEE and to be paid directly to the driver/owner. There are 2/3 privately operated buses from Dehradun (near DDN railway station on Gandhi road) To Sankri. The 200 Km journey will take around 10/12 hours. The busses start at 5:30/6/7 am. While returning from Sankri take the morning bus to Dehradun/Vikasnagar and reach by 7 pm. 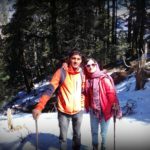 For the treks at Uttarkashi district in Garhwal , one has to reach the capital city of Uttarakhand, Dehradun, specially the trek starting from Sankri, Yamunotri etc. Haridwar, Rishikesh and Dehradun are 3 nearby cities in the area and one can move from one to another by public vehicles like bus or shared Jeeps. For more options to reach Haridwar you can check here. Haridwar to Dehradun: 55 Km and may take one and half to 2 hours. Dehradun to Rishikesh: 45 Km and may take around one and a half hour. There are direct trains from Kolkata to Dehradun. Avoid booking wait listed (WL) tickets in AC classes (1A/2A/3A) or Chair Car (CC). Book Sleeper class (SL)/Second Sitting class (2S) tickets which have normally more seats/berths and hence much better chance to get confirmed. You can reach Dehradun easily from New Delhi by train or bus (~ 6/7 hours) and is around 260 Km. Following trains are good to reach Haridwar and run daily. Always avoid booking waitlisted (WL) tickets in AC classes (1A/2A/3A) or Chair Car (CC). Book Sleeper class (SL)/Second Sitting class (2S) tickets which have normally more seats/berth and hence much better chance to get confirmed. Govt. Road Transport (Roadways of Uttarakhand, Uttar Pradesh, Delhi, Haryana, Punjab etc.) buses are frequently available in day time and night from Kashmiri Gate ISBT (http://www.delhi.gov.in/wps/wcm/connect/doit_transport/Transport/Home/ISBT/Fare+Chart). Tickets are available on board for these regular type buses. From Delhi Airport or Station you can reach ISBT Kashmiri Gate via Delhi Metro service (http://www.delhimetrorail.com/metro-fares.aspx). It is only 4 Km from NDLS and can be reached easily by booking an auto rickshaw. For privately operated bus, you can book online from different portals. Select a boarding point suitably. Overnight Volvo/A.C/Push back buses are available. Normally these buses take up to 7 hours to reach Dehradun ISBT. You can book an auto rickshaw for Railway Station (5 Km away)/Hotel Drona (GMVN) or take a shared auto (Route No. 5) from ISBT. [There are two major bus terminus in Dehradun. The buses from Delhi/Haridwar goes to the ISBT (Inter State Bus Terminus) and the other one is the Parvatiya Depot (Hill Depot, from where you can get the buses going up the hills like Uttarkashi, Barkot, Purola etc) located just beside the Railway station. Nearest Airport Jolly Grant is 25 Km away from Dehradun. book a private taxi to reach Dehradun city. This airport is accessed from Dehradun, Haridwar and Rishikesh easily. The flights are mostly via Delhi. Trekkers reaching on the previous day before the journey to the actual trek base need to stay the night in Dehradun. There are several options in Dehradun for spending a night while staying in Premium, Standard or Budget accommodation. Options vary from Privately operated Hotels/Lodges, to state run Tourist Rest Houses. State run GMVN (Garhwal Mandal Vikas Nigam) operates Hotel Drona complex is 10 minutes walking from the railway Station. You can book an auto rickshaw. From ISBT it is around 5 Km. You can book an auto rickshaw to Hotel Drona (GMVN) or take a shared auto (Route No. 5) from ISBT (Inter State Bus Terminus). This is a reliable and a decent choice for Standard accommodation. The have restaurant and room service. Normally you reach Dehradun from any trek base by 6/7 pm in the evening. You can take any train after 9 pm or regular bus service as mentioned above to reach Delhi or directly to your homeward journey in the same night. Today morning we start our trip from Dehradun. 200 Km long drive takes at least 10 hours to reach Sankri, our trek base. It’s advisable to start latest by 7 am in the morning. Initially after crossing Mussoorie town the road enters the Yamuna valley and we continue along the river for a while. It gets better after crossing the town of Purola. The car goes up the winding road surrounded by blue pine forest. From Mori we follow the course of Tons river. You’ll enter Govind National Park after you cross Netwar and after Netwar you will be following the course of the river Supin. The road gets bumpy at times but you won’t feel much because of the astounding beauty of the surroundings. On your way you will experience dense conifer forest, scattered apple orchids, farming fields and open valleys in between. 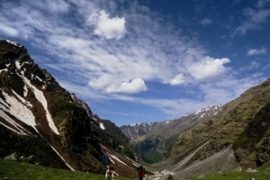 Sankri may appear comparatively busy in a trekking season than the villages you may have visited interior in the Himalayas. But if you look carefully, you’ll find that most of the people around you are either trekkers or the local support staff. We will arrange your accommodation in a home stay at Saur village or in a lodge at Sankri. This will be on sharing basis and on the basecamp always expect a dormitory style room. Saur is actually bigger than Sankri and in the ‘Pahari’ essence too. It is just two minutes’ drive from Sankri. 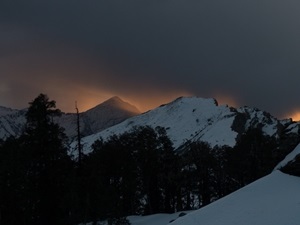 If the sky is clear and you reach Sankri/ Saur before sunset, you can’t miss the vibrant orange and purple hue on beautiful snowcapped ranges of Mt. Swargarohini from here. Over a hot cup of tea, you’ll be discussing the trail with our coordinator/trek guide keeping that beautiful painting into the backdrop. Today morning after breakfast we start our trek to Juda Tal also referred Juda Ka Talao. Initially we follow the road which connects Sankri to Taluka for about five minutes. Then we leave the motor able road and turn right to take the trail which leads to Kedarkantha. The climb for today is throughout of moderate gradient and can be tiring at stretches. The trail starts gaining height among sparse conifers at the beginning. After following the trail for about an hour on the mountain slope, you will find a cement bridge lying on a small stream. The foot trail splits into two and we take the left one. The tree line clearly starts to change by then. You’ll see more Maple and Oak trees in the forest. After ascending for another hour or so you’ll cross a huge fallen trunk to reach a glade inside the forest. Surprisingly a single walnut tree stands tall in the middle. We take a well-deserved rest here. After all we completed halfway to the Juda Ka Talao. Continue climbing after taking a good rest at the “Fallen Trunk” meadow. Before reaching the last meadow of the day we cross another meadow in between. Both of the meadows share surprisingly same characteristics. Both are covered with lush green carpet of soft grass. If you have any time or energy left, allow yourself to walk a few steps barefoot on it. But certainly not at all if it’s cold and snow covered. These are the small pleasures of life what we city dwellers miss back at home. Both the meadows have shepherd huts nearby. Hop inside. Imagine spending a lonely night there sharpening your knife, cooking your own food on a wooden fire and praying all night long that bear doesn’t attack your sheep as does the shepherd. Not really that lonely, huh? Well, you can imagine as many sheep as you want with you! However, let us take a break from our imagination and let us get back to the trek. We turn right from the last meadow and climb for 15-20 minutes more and we’ll reach our campsite for the day. The total distance is hardly 5 Km but it may take up to 5 hours! Judatal is a really pretty campsite. Imagine an undulated wavy meadow amidst a dense Maple-Oak forest and at the left corner of the clearing there’s a small lake which remains frozen in most of the winter. So, what do you think? Pretty enough? There are quite a few stories about Juda Ka Talao. Locals say that this small lake is somehow channelled with a well of Saur villages. Long time ago, a small shepherd boy got drowned in the lake. That little boy loved to play his flute. He carried his flute everywhere he would go. Almost after a week of the tragedy, the flute was discovered from that well in the Saur village. True or not? You be the judge. Today we trekked only about 5 km but remember that we have climbed three mountains and gained considerable altitude. Today’s trek was not that easy as it appears. After an early dinner we call it a night and get into the cosy comfort of the sleeping bag inside tent. 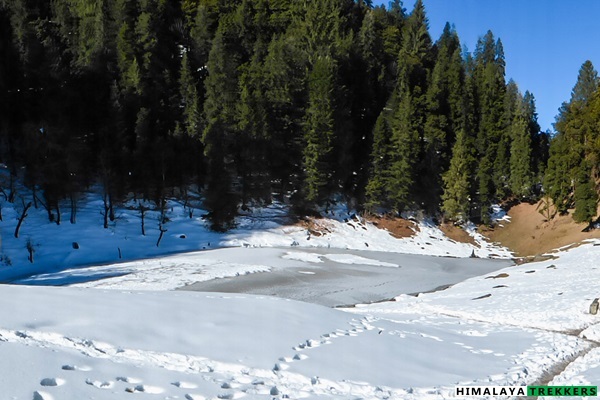 The trail towards Kedarkantha base is clearly defined across Juda Ka Talab campsite. After about 5-10 minutes of climb we reach a vantage point on the slope from where you get a full view of the pristine lake and the grassy meadow. Take out your camera for sure! Climb further and you’ll see the trail going straight forward keeping the ridge to your left. Don’t take that trail but wait for your guide here. That route will take you straight to another campsite called Hargaon. You are supposed to climb the ridge to your left. The trail goes inside the Oak, Conifers and Maple. In winter the snowline would have begun by this point. Continue about an hour of steep climb we reach a spot where stands a solitary shepherd hut. The ascent gets gentler after this point and we’ll reach today’s destination after maximum one more hour of trekking. Spend few minutes here, enjoy the surroundings. As said before, after walking another hour you’ll see a vast opening with few desolated shepherd huts. 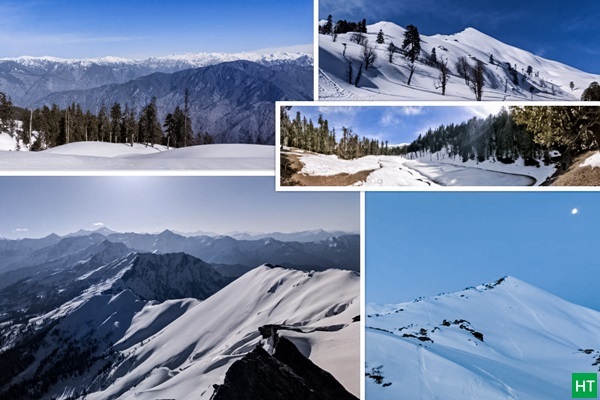 A thrilling view of a 180 degree arc of majestic snow capped Himalayan ranges with significant peaks like Bandarpunch, Swargarohini, Kalanag and Ranglana can be seen from here. Yes, cheer up, we have reached today’s camp site. Now don’t get too carried away with the view. Look left to the arc. You are supposed to start before the break of the dawn next day to reach the top on or before sunrise! We serve the dinner early in the evening, as the last scattered light remains on the horizon. Get into the tent and pack your light day pack, if you have one. Otherwise keep at least a bottle of water and some dry food/chocolates with you during summit. Tomorrow expect tea to be served by 3 am in the morning. Today we start as it has been planned. In December/January it will be pretty cold at the onset of the dawn. Wear warm jacket and certainly a windproof on top. A pair of gloves is a must, if not a waterproof one. Take out your torch, a headlamp is always better as it keeps your hands free. 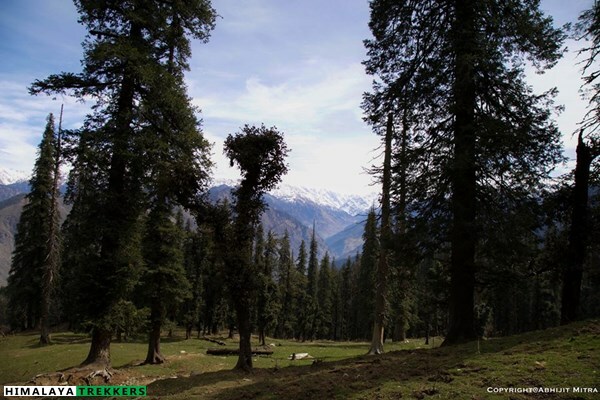 The first hour of the hike takes you through dense Oak/Kharsu forest but as you climb further the forest recedes. You may come across something quite interesting to attract your attention during the initial walk. You may spot pug marks on snow larger than human. Ha-ha, you haven’t discovered “Big foot” or “Yeti” pug marks but probably of the Himalayan Black Bear. And yes, Govind National Park has quite a number of Himalayan Black Bears in its wild life chart. But unlike their pug marks you have to be really lucky to spot one. However, after almost an hour of gentle climb you’ll reach a clearing with a shepherd hut from where there are mainly two trails on the way to the top. 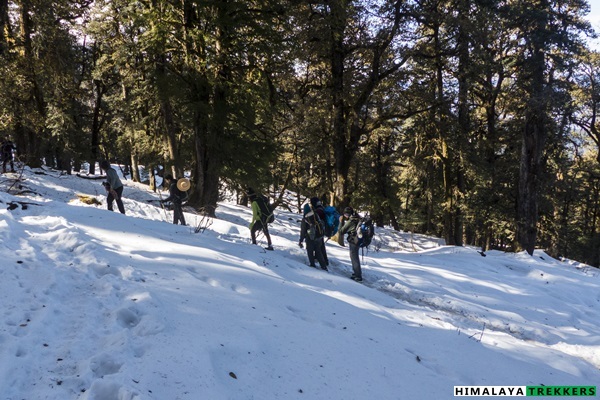 Depending on the conditions, especially on snow in winters most of the hiking teams take the left one while climbing and descending the other way. From here the trail gets steep. After climbing for another half an hour or so, you’ll find yourself above the tree line. The structure of the shrine at the top is clearly visible from here. Usually dawn starts to break by this time. After this point we climb the steep ridge to the top. Follow your guide and his footsteps as he takes you to the top through the switchbacks. The trail can be slushy and icy at stretches in the morning. We will provide you a pair of Anti Slip Grip/Crampon that help you get a better hold. After hiking another half an hour that way you’ll find yourself right in front of the shrine. Don’t stop there. Take left and climb for five more minutes and you reach the top. Yes, it’s a summit, essentially every peak has one. 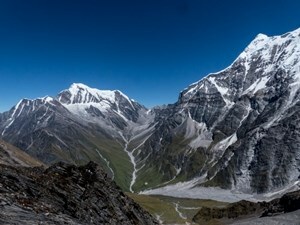 Majestic 360 degree view of the Himalayas waits at the summit. In the southerly direction you can see the wide valleys sloping down. 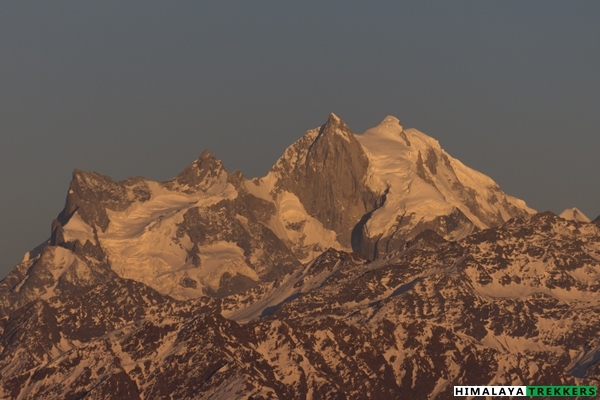 A number of high peaks in Gangotri and Yamunotri ranges can be seen towards the north. 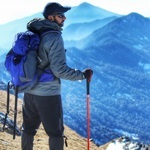 Your guide will help you to spot the Swargarohini range, Mt. 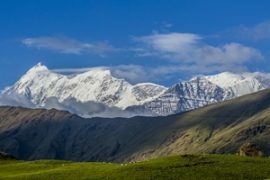 Kalanag/Black peak, Hati parvat, Ranglana and more. Snow capped ranges of Kinnaur forms the backdrop in west. Savour the summit to your heart’s content and head back towards base camp. While going down we may take the alternative route. In winter this trail is fully covered with soft snow and be careful while descending. Use your heel to get a better grip. At times a glissading can be the icing on the cake. 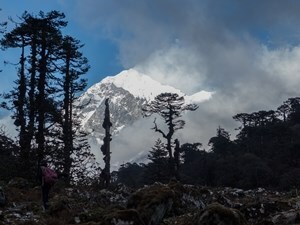 It will take around 2 hours to get to the base camp from summit. Have your hot lunch and enjoy the well earned rest after the tiring summit :-). We camp overnight at Kedarkantha base. Today is the last day of our trekking and it’s all the way down to Sankri. There’s no hurry and we’ll enjoy the morning and then start going down to Sankri. For the first half an hour we retrace our steps to the Shepherd hut where we took a good rest while reaching the base camp. From here we take a different route through dense Maple-Oak forest to the opening of Hargaon campsite. From the clearing the entire Har Ki Dun river valley is distinctly visible dotted with villages on both the sides of the carving Har Ki Dun nallah. Another hour of hike will take you to the cement bridge which we crossed on the first day of our trekking. Saur is not far from here. It takes maximum one hour to reach the Saur village from here and another 5 minutes to Sankri. If you have any more energy left, explore around the Saur village or just stroll around Sankri bazaar. Accommodation will be in lodge/home stay. If you start by 6:30-7 am in the morning, expect to reach Dehradun by 6 pm latest. The trip ends here, but not the memories! 2 night’s accommodation at Sankri (Day 1 & Day 5) in lodge on sharing basis and dinner. All meals during the trek. Regular Indian style nutritious vegetarian food during the trek (including occasional eggs), breakfast packed/hot lunch (depending upon the time you reach a campsite), snacks, dinner along with coffee/tea/soup. 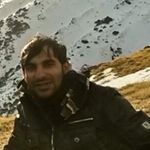 Excellent Trekking Guide, who will be a local to this particular area and has profound knowledge of the trekking trails around. 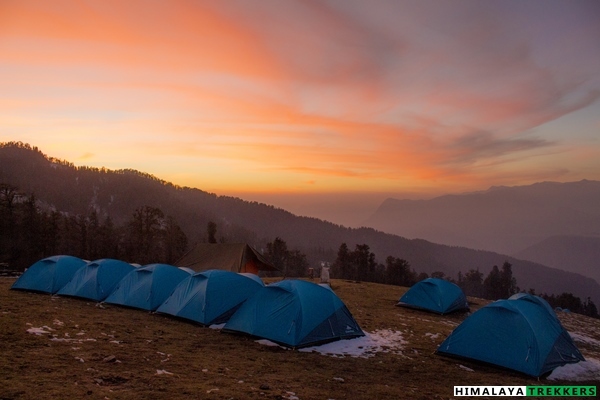 Stay in tents (3 persons dome or ridge shaped tents) on sharing basis during the trek. 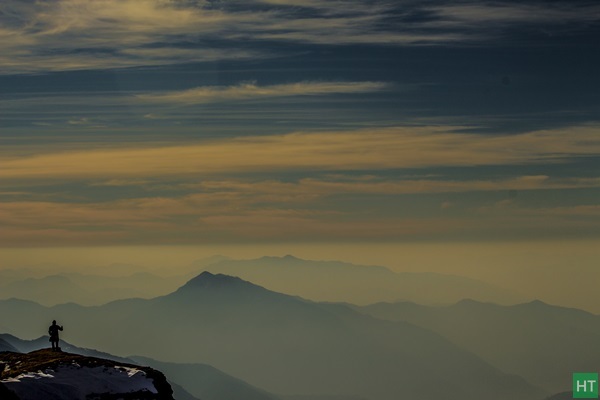 Accidental Insurance Policy covering high altitude trekking tours (For Indian nationals it is included in the TREK FEE, up to 60 years of age). 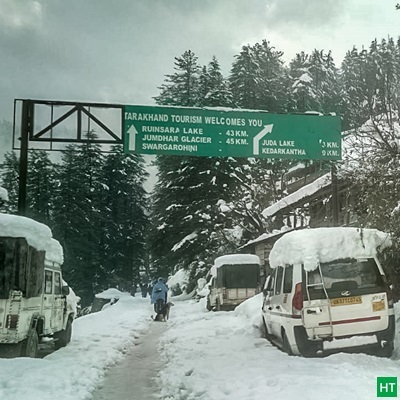 It covers your trek as well as your return journey to Dehradun. We assume that you will carry your personal Rucksack/Backpack with all your personal belongings. If you want to offload your Rucksack and be carried by our Pack Animal/Porter then you need to pay additional ₹ 1200 for the entire duration of the trek. The Rucksack should not weigh more than 10 Kg. Anything is is NOT mentioned in the “Inclusions” or personal in nature. To reserve your place in a scheduled Fixed Departure trek or a Customised/Private trek pay 25% of the TREK/TOUR FEE as the initial “Booking Deposit”. You can pay by Net banking/Draft/Cheque/Credit/Debit/AMEX cards. This will ensure your participation in the desired trek and we will reserve your place in the scheduled date. You need to pay the remaining amount at least 15 days before Trek Starting Date. If in case you are not able to make it due to unavoidable reason(s), we provide you a very flexible choice of Shifting to another trek within next one year. One year is counted from the starting date of the trek/tour you booked initially with us. If you cancel/postpone a trek/tour from 14 days to 8 days before tour starting date, your Booking Amount is Non-Refundable. We will not take any request of shifting dates. We will charge 50% of the amount as Cancellation Charges and process refund of remaining 50%. You may also shift to another group within next year but 25% Booking Amount will be deemed as Cancellation Charge and the rest amount will be transferred to the shifted group. 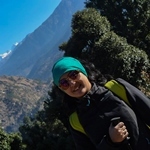 This was my first Himalaya trek and it was a really wonderful experience, the support staff during the trek was really very well trained, the food provided to us during the trek was like the food we get at home A-1 quality, and the best part which I experienced by choosing HT was the small group which was really continent. I’ll defiantly choose HT For my next winter trek 🙂 . We went to Kedarkantha on DEC 16,2017 with you. We had an incredible experience which we’ll cherish it forever. Every thing was very well organised right from transportation, food, guide and accommodation. Our trek guide Mr.Chandra Prakash took care of us really well. 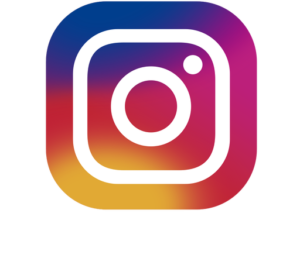 We’re glad to have trekked with you.Hope to do many more treks with Himalaya Trekkers in the future. It really feels great when you go up a mountain, reach its summit, spend good one hour dazing the snow-capped peaks around, looking down upon the clouds and return with the tales of achievement. 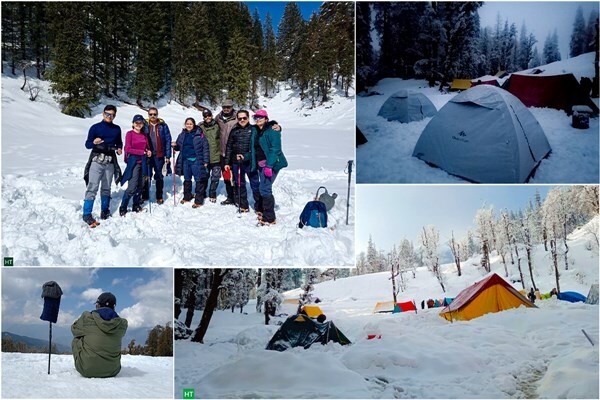 It is not just the four days of trekking amidst the pine trees or on the snow, but the entire phase of planning, preparation (both physical fitness and logistics). Would it not have been the guidance that I received regarding the choice of clothing, shoes, physical training schedule, right at the onset, completing the summit could be difficult. 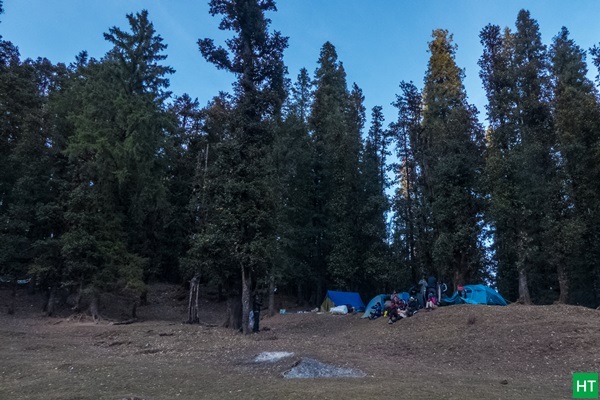 No, it was not just the walk, but knowing the place, people, their lifestyle, listening the tales of other trekkers, setting up a camp and sleeping in the blue tent under the starry sky. I will look forward for another trek with you guys, in some other magical destination. Excellent trek. Very co-operative and helpful staff. Very good guide. They were giving lot of things to eat. 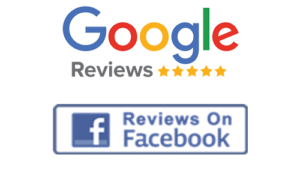 Cheerful and very much friendly – great place. Firstly, I would like to thanks Sapta for arranging KK trek within very short notice. I usually not prefer to go with trek agency due to miss management but here I found everything was arranged in proper way like camping, equipment, and food. Our cook Kamal prepared very good food during the trek. For every trek the team members and team size is very important. If team size is limited then guide can take proper care and I found the same is here. 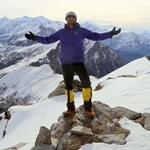 It was really memorable trek for me. Thanks Himalaya Trekkers for given opportunity to walk with you. Cheers. 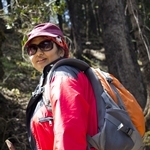 My first trekking was with HT. Initially, i was so scared, but later on i really enjoyed a lots throughout the Trek. Starting from day 1 up to last day HT team guides us very carefully and properly. Those days were unforgettable to me. All the arrangements were very good. But one Suggestion from my side is, It would be better if HT provides the Trekking Shoe to those who are really need that. 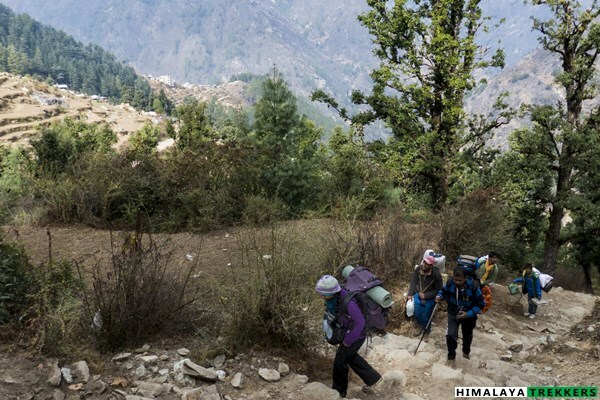 During trekking,I saw that some people (including me) were facing really difficulties.